Come as guests. Leave as Family. "We really enjoyed our stay here. The dog-friendly rooms are very clean - really happy to see a hard surface and no carpet at the beach, makes the room feel and smell so much cleaner! It's a short walk from the hotel to the beach and Yaupon Pier, a really great location. Also appreciate being able to stay here with our dogs: there's a grassy area to either side of of the hotel, but the immediate area is great for walking the dogs and they enjoyed their stay as much as my husband and I did. We hope to stay here again!" 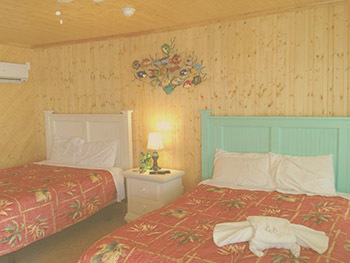 "Best motel on Oak Island... Before we rent our beach houses on Oak Island we would always stay at an ok motel since the options were VERY limited..,until we found this Beautiful newly decorated motel with immaculate rooms!! Although everything is newly renovated and beautiful.... the best part is the extremely welcoming and wonderful owners... We always feel like family!!" "Amazingly beautiful, clean, welcoming place to stay. Would recommend anyone and everyone to stay here while visiting Oak Island. The rooms are immaculate and beautifully decorated! The staff are helpful and polite. The owners are the kindest and most generous people you will ever encounter when staying at a hotel. We look forward to going back every year and spending time creating great memories here!" "Before heading to OKI, I searched for accommodations. All of the reviews for this property were positive and the pics looked so nice, so I thought I would give it a try. Needless to say, I was very pleased with the accommodations! I fell in love with the Oak Island Inn! The owners are great, extremely friendly, helpful and accommodating. The room was recently renovated and was decorated tastefully in a beach theme. The owners were very interested in hearing my opinion of the property and the renovations. I was so impressed that I showed the room to friends who live on OKI! 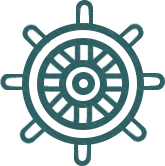 New everything: flooring, wall/ceiling coverings, window, cabinet, fridge, microwave, coffee maker, closet, bedding, and bath! Although it is small, the bath was very modern. Most importantly, the entire property is clean as a pin and I felt safe while there. I literally parked in front of my room, and even left my room door open while packing my car, and vice versa. You just don't get that kind of experience at other hotels. The owners even came to tell me goodbye before I left! I loved it and will definitely be going back there to stay. I highly recommend the Oak Island Inn!" At the Oak Island Inn we are pleased to welcome you to stay at what we have put so much work into. We are a family owned and operated motel to which we hope that when you leave after staying at our place you will feel part of the family. The Oak Island Inn is a place for families to get away and enjoy their time and vacations at one of the best beaches around. Each room we have will make you feel right at home with the best rates on the island. 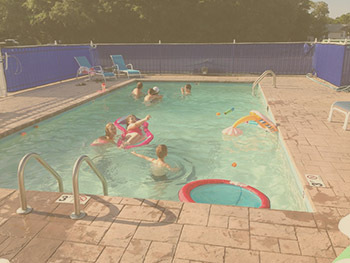 Enjoy a swim in a pool during the summer and public beach access. The Yaupon Beach Pier is only a short walk away.